Mystics star Elena Delle Donne hasn't been her usual efficient self since she suffered a bone bruise in Game 2 of the WNBA semifinals. But as she showed in the Mystics' close defeat to the Storm, she's starting to figure out what she can and can't do. Since falling awkwardly and suffering a bone bruise 10 days ago in Game 2 of the WNBA semifinals, Elena Delle Donne is slowing coming to realize what she can and cannot do on the court. Quite frankly, the five-time All-Star isn’t as dominant as she was before the injury, but the 6-foot-5 forward is still capable of carrying the Mystics for stretches. 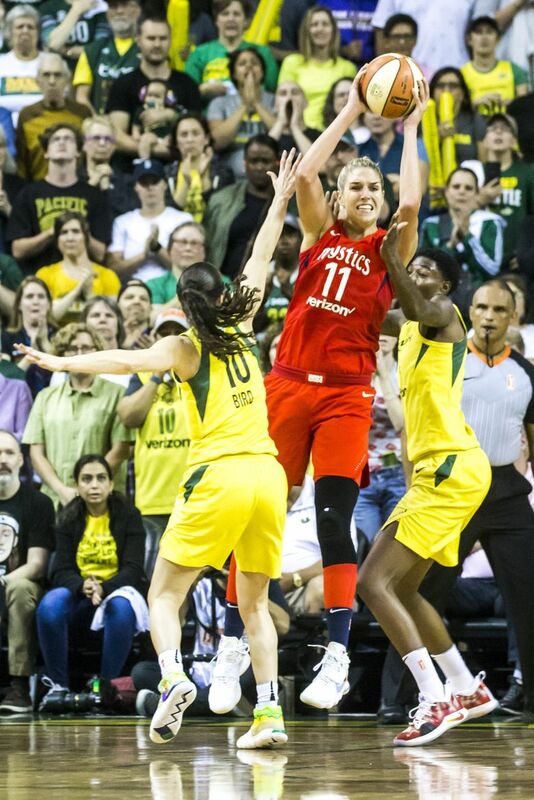 Through three quarters in Game 2 of the WNBA Finals — an eventual 75-73 Storm win — Delle Donne scored 17 points on 7-for-15 shooting and the Washington Mystics led 61-58 heading into the fourth. Delle Donne played the entire 10 minutes in the fourth but managed just one attempt from the field and was held scoreless as the Storm won Sunday for a 2-0 lead in the best-of-five series. The Mystics were outscored 17-14 in the final frame. “I think we fell in love too much with me getting the ball on the block,” Delle Donne said. “I’m more than just a back-to-the-basket type of player. Playing in space opens up my teammates, also opens myself up. The Mystics did not attempt a free throw in the fourth quarter, while the Storm was 5 of 8 from the line. Still, Washington’s hierarchy revealed itself in the fourth quarter on Sunday. With a chance to steal a game and return home 1-1, the Mystics turned to All-Star guard Kristi Toliver and rookie forward Ariel Atkins to take the biggest shots. Delle Donne didn’t touch the ball in the final five minutes. Defensively, Delle Donne lacks the lateral quickness to contain league MVP Breanna Stewart, who scored 25 points on Sunday’s Game 2 and had 22 on Friday in Game 1. “Elena plays at her own pace, which is what makes her really hard to guard,” Storm guard Sue Bird said. “She lulls you at times. With a knee injury, it can definitely impact your explosiveness. But it seems as if she might be adjusting and understanding what she can and can’t do and just doing things that she can do. The Storm committed 15 turnovers, the most this season. The miscues led to 17 points for the Mystics. Seattle forced just two turnovers through three quarters and swiped five in the fourth which led to five points. “We weren’t on the same page,” Toliver said. “The way they were covering us, we weren’t giving releases, giving outlets when they were either trapping or being physical with the Elena on the block. The Storm had just two turnovers in the fourth. Sue Bird moved into second place on the WNBA’s all-time playoffs assists list with 248, behind Lindsay Whalen (340). The Storm out-rebounded the Mystics 36-26 and collected 11 on the offensive glass. 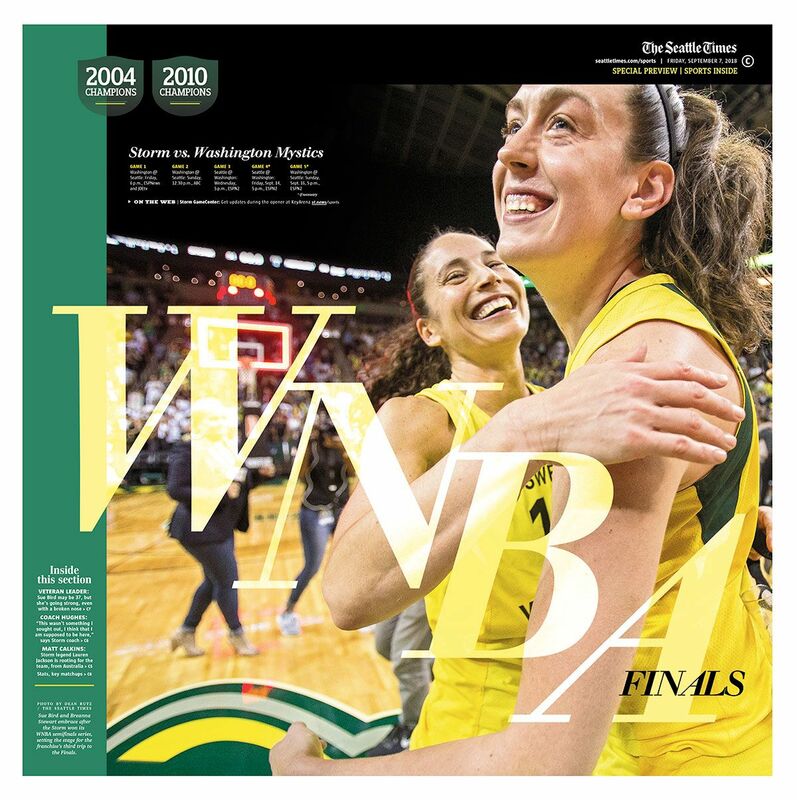 Since 2005, Seattle is the fourth team to go up 2-0 in the WNBA Finals (Seattle also went up 2-0 in 2010). All the teams that went up 2-0 went on to complete the sweep. Including the regular season, the Storm has won 16 of the last 17 home games against the Mystics, a streak dating back to 2006. Game 2 courtside celebrities included Eddie Vedder from Pearl Jam and NBA star Nate Robinson.